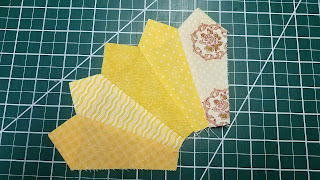 Seamless Piecing: Dresden Plates and Pie... Oh my! Dresden Plates and Pie... Oh my! The Dresden Plate. Even the name sounds exotic. 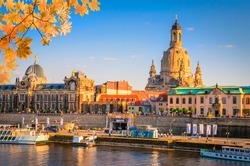 Before WWII, the city of Dresden, Germany, was so beautiful it was nicknamed The Jewel Box. It was an epicenter for Victorian art, including beautifully decorated fine porcelain featuring fruits, flowers and foliage. 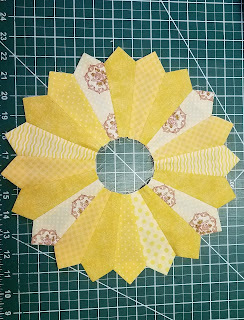 It's no wonder the quilt block with a plate-like motif, pieced from the floral patterned fabrics popular in the 1920's and 1930's, took the name Dresden Plates. Sadly 90% of the beautiful city was destroyed in bombing raids during the war. The earliest known American made Dresden Plate quilt is labeled August 1785, but 100 years pass before we see another one. This is why we label our quilts my friends! By the roaring '20's, the Dresden Plate design had become one of the most popular quilt patterns in America. And it would continue wildly popular for the next 2 decades. I am fortunate to own a Dresden Plate quilt, made by my grandmother during that time. But that's a very long and sentimental story for another time. I love Dresden Plate quilts! I'm happy to see they've returned to popularity. Dresdens and plates and pie all seem to go together. Probably because they're all round like circles, or maybe because I think anything goes with pie. Circles are made from wedges. Pies are cut into wedges. 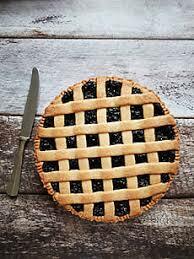 You probably remember learning about pie charts at about the same time you were learning to write in cursive. To cut wedges for the Dresden Plate block you'll need a wedge ruler. The most common wedge rulers for Dresden Plates measure 18 degrees or 22.5 degrees. There are other sizes out there, but if you only own one wedge ruler it's probably one of these two sizes. The difference is, an 18 degree ruler creates 20 wedges for a full circle, while the 22.5 degree ruler makes 16 wedges for a full circle. More degrees = fewer wedges. Either size is great for what we are doing. I'm using the 18 degree ruler because it's what I have ... and because (Spoiler alert!) for the upcoming project I think more wedges is better. I strongly recommend purchasing a wedge ruler. They sell for under $10. While you are waiting for it to arrive, you can use a regular straight edge ruler. 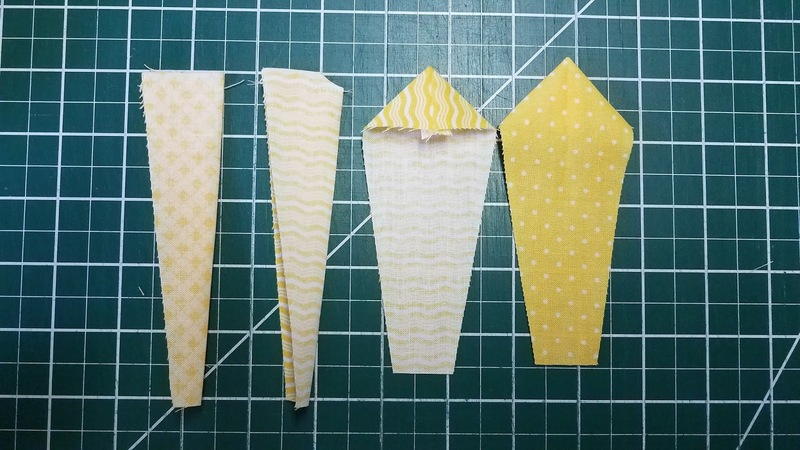 For this tutorial, you'll be making 16 - 20 blades/wedges, depending on which ruler you use. You'll need a 2 3/8" x 5" rectangle for each blade. (22.5 degree blades will be about 3" wide). Sew the wide end of the wedges into points the same way we sewed the pickets for Witches Pickets. If you don't remember how to do that, click back and review. The only difference is pickets have straight sides and wedges are narrow at the bottom. Cut the wedges. For an 18 degree ruler, cut 20. Fold each wedge in half lengthwise, right sides together, and finger press a crease to about 2" down the center. 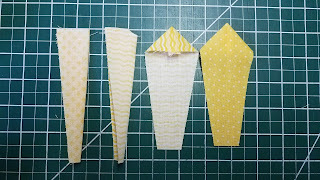 Turn the peak right side out and pointy, line up the seam with the crease and press flat. Don't make this harder than it is. It's a 1/4” seam, just like always. 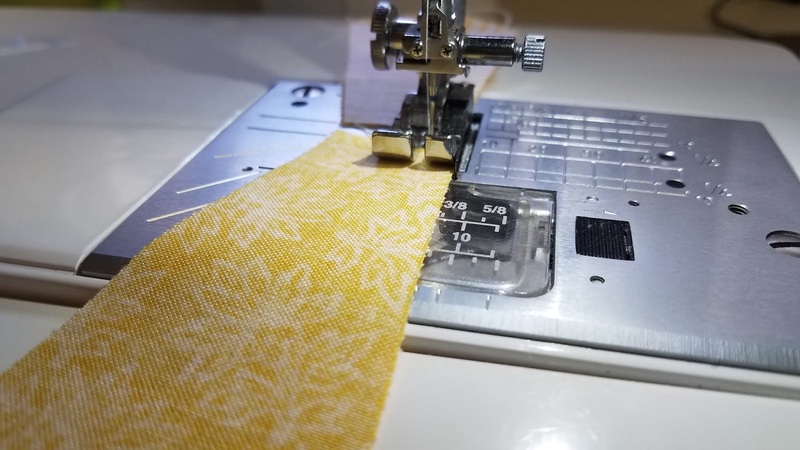 Keep seam allowances consistent, seams pressed open and units flat. 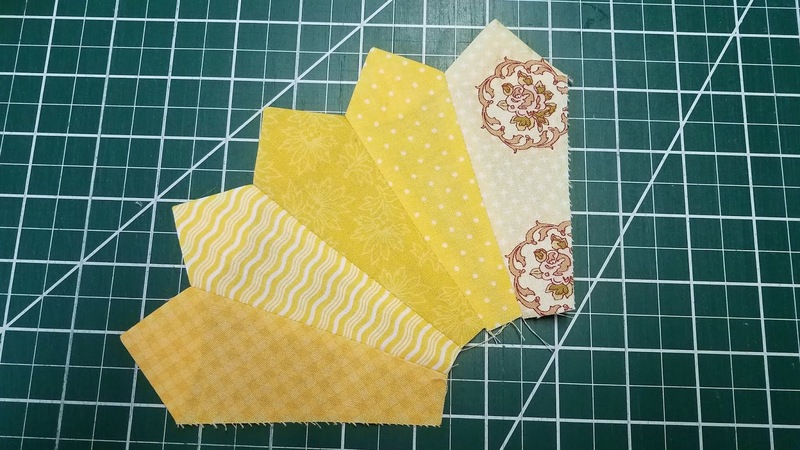 Tip: When sewing wedges with picket ends, it can be a challenge to keep the turned fabrics from slipping out of alignment at the “shoulders”. Starting at the shoulder, run a small bead of WASHABLE school glue an inch or so down the side you'll be sewing, heat set with a hot, dry iron. Problem solved. After sewing, gently pop open the glued parts. The glue is water soluble even after drying. 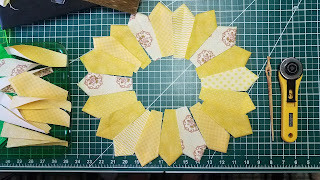 If you are using scraps, lay them out into a ring until you like the arrangement. Take a photo for reference. Pair 16 of the wedges, right sides together into sets of 2. Leave 4 wedges single if you are using the 18 degree ruler. Line up one side of each pair for sewing. Tip: When sewing Dresden wedges it's good to sew some seams from the top down and some from the bottom up. There's no science to it. Just do some of each. Chain piece, leaving about an inch of stitches between. 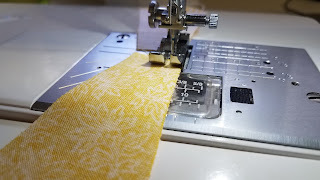 Hang onto your machine's threads so the needle doesn't push the seam into the abyss on the first stitch. You know what I'm talking about. Press all seams open and pairs flat. Now, pair sets of wedges. Line up one side for sewing. Sew and press. If using the 22.5 degree ruler you should have 4 sets of 4 blades that lay at 90 degree angles. If your wedges are 18 degrees, sew a single blade onto each set, making 4 sets of 5 blades that have angles of 90 degrees. Press. You'll be able to do some manipulation, but if you really need to "let out" or "take in" some seams to get a good fit, now is the time to do that. 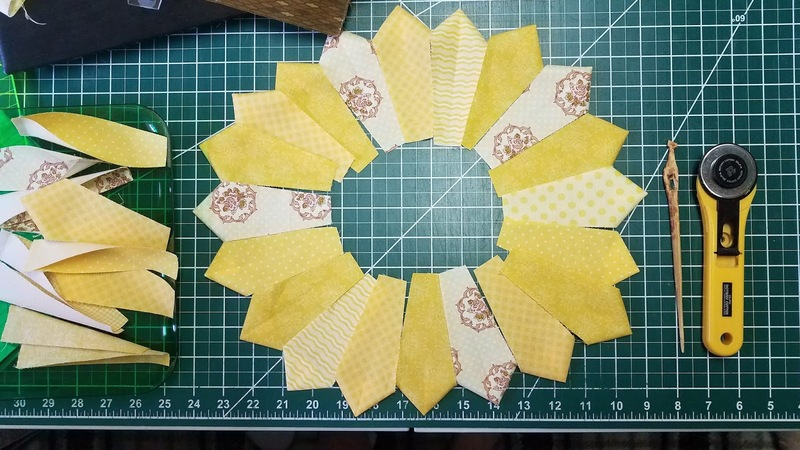 Sew 2 quarter circles together to make half circles. When you are happy with how it fits together, sew the two halves together. Press seams open and the plate flat. Your plate should have a diameter of 12 1/2". (Spoiler alert!) I'm leaving my plate as it is to use in next week's project. If you want more practice *wink wink*, I suggest making another plate the same colors but with 4 1/2" wedges. 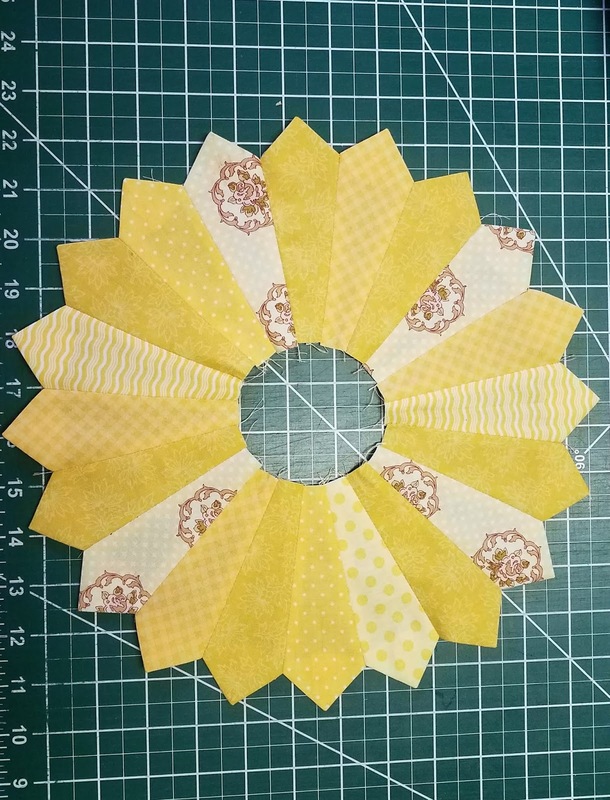 Tip: If you are using a template you made, just cut 1/2" off the wide end. DONE! You made a perfect (enough) Dresden plate. Nice job! Stand back and admire your work. You've done something many quilters won't even attempt. Next week is FREE pattern week! We'll use your Dresden plate on a very cute project. Don't forget to FOLLOW! Leave a comment if you have questions or anything you want to add. PS. There's a Facebook Page where you can show off your beautiful Dresden plate.